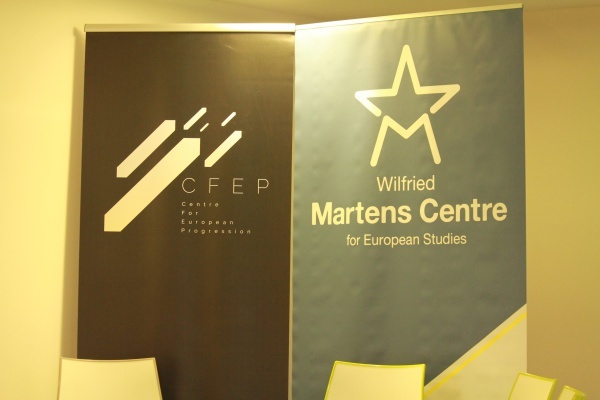 Centre for European Progression (CFEP) and the Wilfried Martens Centre for European Studies organised a debate about the Cyprus reunification. 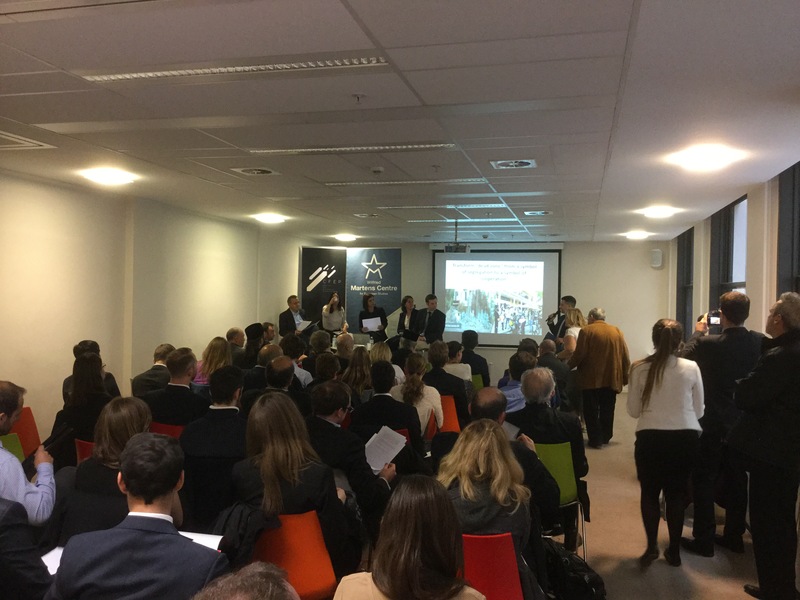 This event received financial support from the European Parliament. Sole liability rests with the organisers, the European Parliament is not responsible for the activity. The panel discussion was preceded by a historical overview of the Cyprus crisis, including the mention of the rejection of the Annan Plan in 2004, which brought up questions about the reason behind so many expectations for a positive outcome of current negotiations between Anastasiades and Akinci. Rena Hoplarou, Head of the Bi-communal Committee of Democratic Rally of Cyprus, started the discussion stating that the positivity which surrounds the negotiations is due to the devotion of both leaders to reunification. The recent elections resulted in the most multi party House of Representatives in the history of Cyprus, with an overall 56% support for the negotiations. The reunification is a major test for the government after the economic meltdown, and the feeling that prosperity will come with the solution might lead to a much needed coalition to find one, exploiting the momentum. – We have two leaders who have proven to be truly devoted to the idea of reunification. They are both vocal advocates of the benefits of reunification. – Twelve years after the previous failure people ceased to believe in the politics of “a better solution”. – At the same time, various kinds of research show a growing disbelief in any significant change. – There is an encouraged feeling that prosperity and growth will come with the solution. – The developments regarding energy issues demand cooperation between the two communities and Turkey (which in its turn demands a win-win attitude). – Recent Developments in Turkey make the Turkey – TC relationship even harder for TC. EU serves as a safeguard for TC to survive as a community. The 2015 SCORE index for Cyprus saw an increase in the support towards reconciliation from the Greek-Cypriot side and a slight decrease in the support from the Turkish-Cypriot side because some important areas were excluded from the negotiation talks (such as health care). Ms Hoplarou concluded stating that both a strong top-down leadership and bottom-up work are needed to find a solution along with social relations between the communities to reduce prejudices and create an inclusive Cypriot identity. The final timeline according to her is the end of 2016, as 2018 is the year of presidential elections. MEP Costas Mavrides from the Democratic Party (DIKO), began his speech by saying that the positive climate present in the beginning of Akinci’s mandate has been replaced with the feeling that the solution will be found only when Turkey, especially Erdogan decides to solve the Cyprus problem. The Greek and Turkish Cypriots do not have many differences except when it comes to deciding how to share the power under one single European state being an evolvement of the Republic of Cyprus. There are some core issues to be addressed such as settlements, the presence of Turkish troops in occupied northern Cyprus, territorial adjustments, security issues. On these issues no compromises can be made. This requires for a constructive and active role of Turkey in the negotiations as well as political will to reach an agreement. Mr. Mavrides pointed out that if we are going to have a referendum, this time it has to be YES from both sides and to achieve that, we need confidence for strong security, that can only be offered by the EU, namely the acquis regarding the fundamental human rights and rule of law. It is unacceptable to have an EU Member State with Turkish troops on its territory. 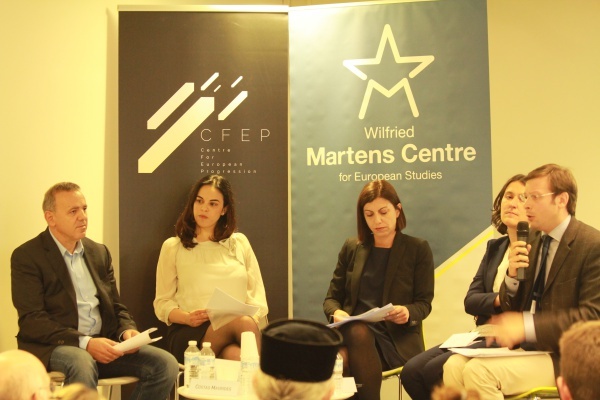 In comments also by Turkish Cypriots on their “isolation” from the European Union and to upgrade the status of the breakaway regime in the occupied area of Cyprus to a recognised ‘state’, Mr. Mavrides suggested the European legitimacy in response. Addressing the Turkish Cypriots the MEP stated that “in the EU there are Member States and not Member Communities. We (Cypriots) are here in Brussels as European citizens, both you as Turkish Cypriots and I, because the Republic of Cyprus joined the EU as a full member in 2004 with all its territory, including the occupied area”. In comments that gas could affect positively the Cyprus solution, Mr. Mavrides explained that natural gas could contribute to the economic development of the whole Cyprus, however the Republic of Cyprus is proceeding to its exploitation and extraction as it is located within the Exclusive Economic Zone of the Republic of Cyprus. MEP Kati Piri, the European Parliament’s standing Rapporteur on Turkey, stated she does not expect the government in Ankara to block the settlement process. Emphasising the fact that negotiations for reconciliation have never been so constructive, Ms Piri mentioned the positive effect that Cyprus’ reconciliation could also have on Turkey-EU relations. Therefore, stating that it is very much in the interest of Turkey to head for a solution. Piri believes that the momentum is there because of the strong political leadership of both communities on the island. 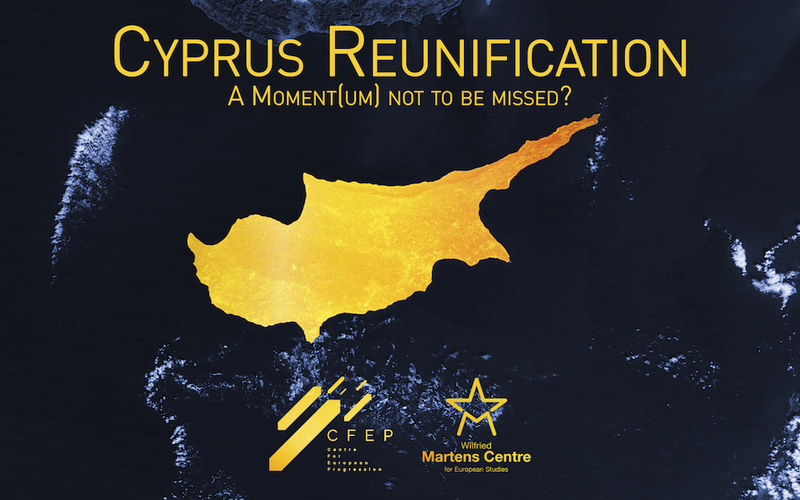 The reconciliation not only would have positive effects on all Cypriot citizens, but also on the whole region. The rapporteur underlined the fact that in 2004 the EU did not use its leverage to pressure for a solution with the Annan Plan, however, now it’s time to focus on the future and not the past in order to find a solution. It is crucial that the EU strongly supports the outcome, without overtaking the negotiations. 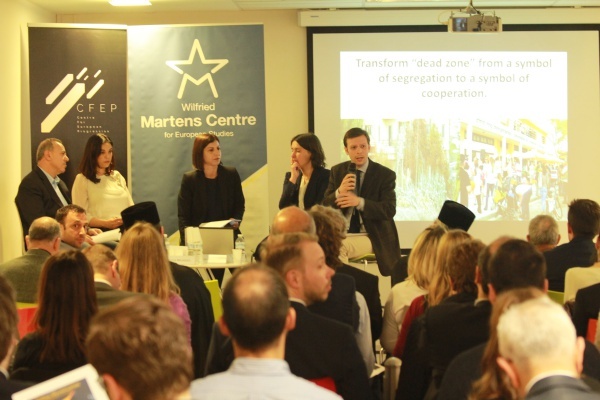 MEP Piri highlighted the difficulties still ahead, but also expressed confidence that this decade-long conflict in Europe will be resolved before the end of the year. The issue that the EU acquis communautaire has been suspended in the northern Cyprus following the accession of Cyprus as a divided island to the EU in 2004, as well as its negative implications on the Turkish Cypriot Community was raised by Ms Lale Shener, Brussels Representative of Turkish Cypriot Chamber of Commerce. Ms Shener described the fact the Turkish Cypriot Community is subjected to economic restrictions due to the continuation of the Cyprus problem and do not enjoy full rights and benefits of the EU which leads to difficulties in competing on the international level for businesses located in northern Cyprus. She argued that the economic situation on both sides coupled with the discovery of hydrocarbon reserves in the Eastern Mediterranean, it is the economic prospects of the reunification which has helped significantly to build the current momentum for a comprehensive settlement now. She pointed out that the economic benefits that a solution would bring should not be underestimated in the negotiations: tourism, trade, real estate, construction sector, just to mention a few, would see a great increase in their activities. She said that the alternative to the solution would be the continuation of the status quo; deprivation of our country and the region from its full economic potential, adding to the instability in the region and letting the potential energy reserves to aggravate tensions in the Eastern Mediterranean. She said this is why it is the time for the leadership to show political will, courage and creativity to take the negotiations to a concrete result. However, she said there is still work to be done in relation to the confidence building measures to overcome the mistrust between the two Communities. She urged the Greek Cypriot leadership to show the necessary political will for the implementation of these confidence building measures. On the point raised during the panel discussion that the EU could not use its leverage back in 2004 to push for a solution to the Cyprus problem, Ms. Shener said not only the EU could not use its leverage in 2004 to push for a comprehensive settlement, but it also failed to take the necessary steps towards the Turkish Cypriot Community to show them that they belong to the EU. Stating that not even the EU direct trade regulation could not be adopted as promised by the EU, Ms. Shener said that it is of utmost importance to speed up the efforts of preparing the Turkish Cypriot business community for EU integration. Otherwise, if the business community does not feel prepared, they would reflect this on their voting in the possible settlement referendum. Ms Shener concluded her intervention with a statement: “A lot is at stake if the opportunity to reunite Cyprus will be lost. So the choice is clear- all parties concerned need to demonstrate their visionary, constructive leadership and commitment to find a just and lasting settlement. Our Chamber will continue its efforts for the fulfilment of this aim”. The Q&A session addressed geopolitical factors playing a role in Cyprus’ reunification, external pressures and reasons of the failure of the Annan Plan. All the speakers agreed that there could not be a better time for a solution considering that the Cyprus situation contributes to the instability in the region and that in a few years the geopolitical issues and international pressures might increase. Ms Rena Hoplarou concluded the discussion stating that the only way to solve all the issues from gas to education is to have a win-win attitude. There are 9 more months to find top down and bottom up solutions for the reunification of the island.